To the millenial music lovers, especially the hip hop scene in Russia, the name of Yegor Nikolaevich Bulatkin or better known as Egor Kreed is quite big. He was born in Penza, Russia on June 25, 1994. His real passion for hip hop started at the age of eleven when he heard a song from 50 Cents. He’s been very serious about going deep into the music industry ever since. His sister also works on the same field as a singer and actress. Egor has moved to Moscow to pursue his musical career. At the moment, most of his songs are in Russians but everyone can still enjoy them because, hey, music is universal. You don’t have to understand the lyrics to enjoy the beat. The great turn in his life happened in 2011 when he uploaded a video of him singing Lyubov V Seti on YouTube and it received millions of views. He got people’s attention there, not only from Russia but also around the world. He’s been productively writing songs and making videos ever since. He has also collaborated with other Russian musicians. But, what we will go deep about in this article is actually not Egor’s music but his love of fashion. Are you a fan of Egor Kreed? Here are 3 outfit styles you must copy from him. Just like most hip hop singers, Egor also loves wearing sporty apparel both on and off stage. It is comfortable, simple, light and stylish. You can easily combine tracksuits with sport shoes or sneakers and voila! You are good to go. Some of Egor’s favorite brands for this style are Balenciaga and Palm Angels. Street wear has always been the true identity to hip hop artists. There is actually a long history surrounding this, because when this genre of music was first making a breakthrough in the industry, a lot of sportswear brands refused to support the artists because they didn’t want to get associated with the dark side of it; drugs and violence. But, of course, time has passed and things have changed a lot since then. Egor often wears jackets for his outerwear to many occasions as well as for his daily activities. He has been seen sporting many sorts of jackets to complete his casual looks. He loves trying out different kinds of fabric like denim, flannel, simple cotton, nylon and even parachute. For the rest of the clothing, he just simply wears a t-shirt, a pair of jeans, sneakers, a baseball cap and sometimes a sling bag. On some events he also wore polo shirts, plain cotton shirts tucked into his jeans and a belt. Casual fashion style is also called leisurewear. It is anything that goes the opposite way with formal wear. Casual style emphasizes on personal comfort and individuality. However, it can still be worn to formal invitations but should be carefully worn, which means the clothings are supposed to be clean, neat, and well-matched even though relaxed. In the 90’s, this kind of fashion style was often sported by members of boybands; unbuttoned cotton shirts, singlets, loose cotton pants and a pair of loafers or white sneakers. Egor doesn’t really wear this kind of style except for videos, photoshoot, or musical events where he is meant to swoon his female fans. He is also known as the man in the fur coat which seems to be a mix and match of flamboyant and alluring fashion styles. Sure in Russia wearing a fur coat is actually not a big deal. A lot of people wear them. But when it is sported by an icon like Egor, it becomes a bomb. Like most hip hop singers, Egor loves to collect accessories to go with his sportswear like necklaces, gold chains and other jewelries. Back to the history of the genre itself; early hip hop singers came from the dark side of town, the suburbs where people were poor and crime rate was high. When they made it to the top, they wanted the people who had turned them away or mocked them see their success. The sweetest way was by showing off their wealth. The common lyrics to this kind of music also about dreaming big and getting filthy rich. Now you can see why jewelries and heavy gold chains matter to laden a hip hop singer’s looks. Another thing that Egor Kreed loves to collect is shoes. Sport shoes, mostly, and some boots. A celebrity would become a fashion icon once they become popular. Same thing happens to Egor Kreed. He has 1,5 million subscribers now on YouTube and 9,8 million followers on Instagram. There is even an account on Instagram dedicated to his fashion style using the handle of @clothesofegorkreed_ . The world pays attention to what he likes to wear and a lot of them want to imitate his style. In 2012, he signed a contract to join the Black Star label. This company doesn’t only produces music videos and songs but also runs a clothing label under the same name. The style they carry is street wear and sportswear – what Egor would definitely wear – like tracksuits, sweaters, t-shirts, and many more. You can easily find the label online and see Egor wearing their products in his videos or photoshoots. We can conclude that Egor Kreed’s fashion styles are not too hard to try out since most of the apparels he likes to wear are quite common and easy to find. You may even already have some of the items in your wardrobe. 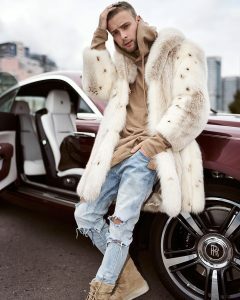 If you are a fan of Egor Kreed, you would definitely want to try and copy the 3 outfit styles of his that we have spread nicely out for you.